Your protuberant abdomen is a source of inconvenience or even distress? You still have abdominal loose skin despite diet and exercise? Dr. Fanous uses a ”Mini-Dissection” technique on the majority of his patients. This approach uses a limited to medium dissection. A complete tummy tuck involves an incision around the belly button and another long incision that runs in the lower abdomen. This abdominal skin is then lifted, and the muscle is tightened with sutures. 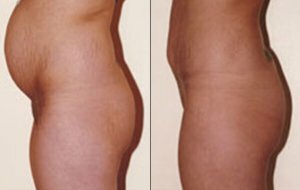 The excess skin and fat is removed. Warning: These photos are published for reference only to provide information on the nature of the intervention. They do not constitute a guarantee of results. Patients who reached their ideal weight are the best candidates for a tummy tuck. Abdominoplasy takes about 3 to 4 hours to be performed. It is required to wear elastic clothes to support your new shape for a few weeks after the surgery. Most patients return to work in 2 to 3 weeks. During the recovery time, you’ll be monitored by Dr. Fanous to make sure that everything is under control. Meanwhile, you’ll also be able to ask all your questions and talk about your concerns. You would like to discuss tummy tuck with us?